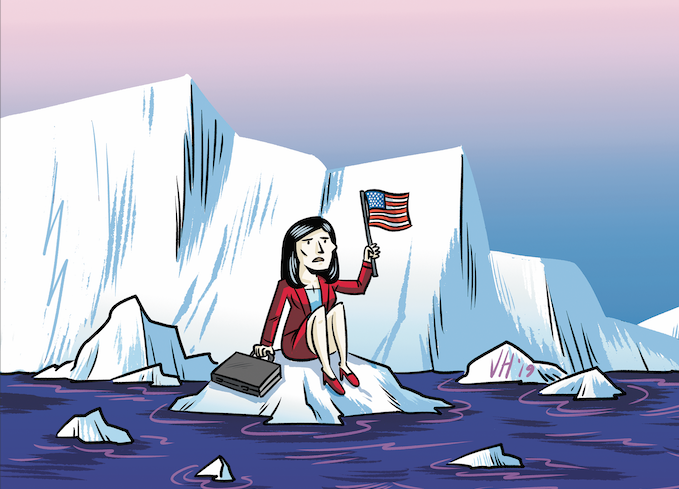 In last week's cover story, environmentalists explained a little about how they're working to get people onboard with taking action to combat climate change. Across the board, those interviewed expressed excitement for policies that can address carbon pollution through taxation and pointed to rising levels of support for those and other clean energy policies across the country. But that may come as a surprise if the results of recent carbon tax efforts in Washington are any indicator. In November, Washington voters rejected a carbon tax proposal, with nearly 57 percent voting "no" on Initiative 1631. In 2016, a carbon tax with a different structure, Initiative 732, was rejected by more than 59 percent of voters. 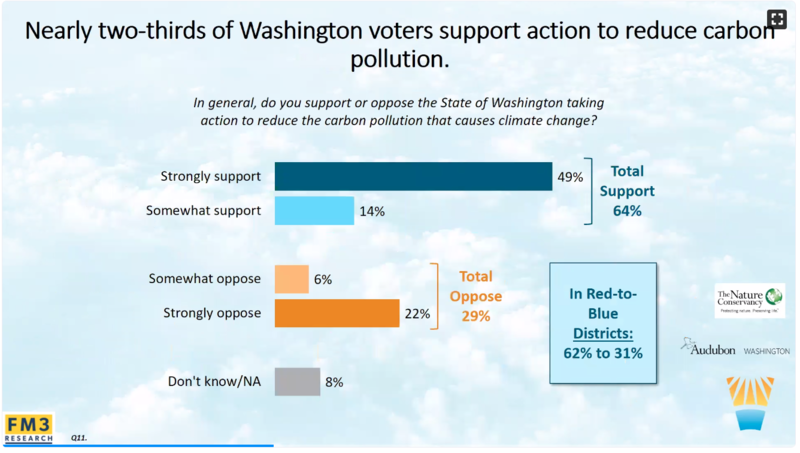 The lack of support for those initiatives would seem to indicate distaste for carbon measures, but a survey conducted the week of the 2018 election shows that Washington voters overwhelmingly say they do support addressing carbon pollution and moving toward clean energy. They just apparently think a different structure is needed. According to the survey conducted by FM3 Research, a firm hired by climate-focused groups to see where the state's voters stand on climate-related issues, the concept of getting Washington to use cleaner energy and fight climate change was supported by 65 percent of the roughly 1,200 voters surveyed. A slide from a presentation highlighting some of the results of FM3 Research conducted with about 1,200 Washington state voters the week of the November 2018 election. But the survey and election results indicate there is discord about how to do that. Among those in the survey who voted "no" on 1631, about a third said it was because they didn't support taxes or a carbon tax. Others said they didn't think there'd be enough oversight of the committee that would have directed the revenue the tax would generate, while others still said the measure was poorly written or that they didn't want to see gas prices go up. 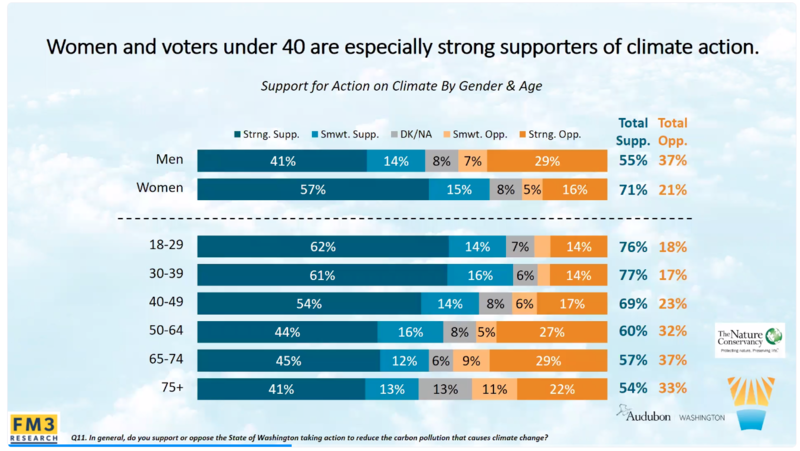 In looking for a path forward, the groups will want to look at who exactly supports climate action the most, Metz explained, pointing to women, people under 40, people of color and those who are lower income as the strongest supporters, though people across all income brackets and ethnicities strongly support action. 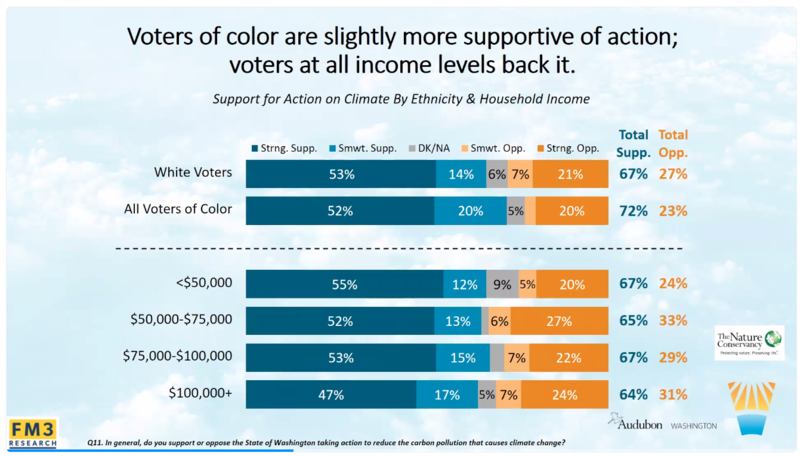 "Communities of color in Washington state and the lowest income households tend to be more supportive of action than our white voters or more affluent voters," Metz said. "The differences aren’t huge, but it does suggest those constituencies are a strong base for wanting to see the state move forward on these in the future."